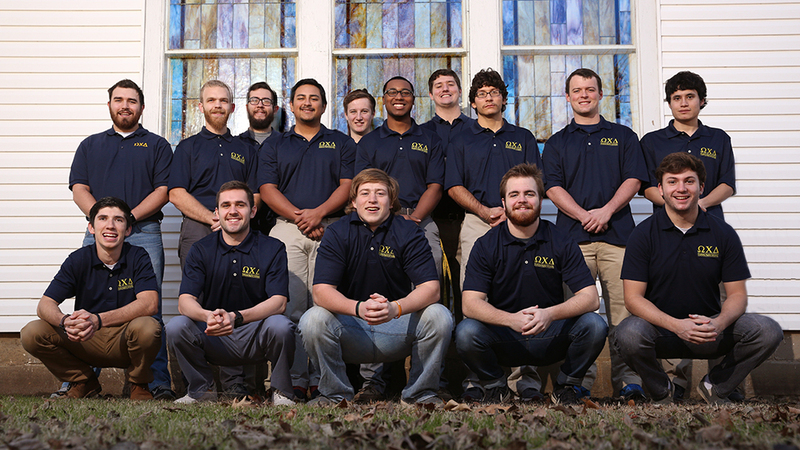 Omega Chi Delta is a men's social group which is designed to foster the intellectual, spiritual, physical and social growth of each individual member. The group's motto is "Obedience to Christ and Discipline." Omega Chi Delta seeks to serve the OBU campus and Shawnee community in unique and powerful ways. Any male student at OBU is eligible to participate in Omega Chi Delta. Any student who is interested in joining must first attend an Open Rush. Then the student will be examined by the University to test for academic standards that must be met. After approval from the University student must participate in a Closed Rush interview. Once approved by the current members the student is then expected to participate in Rush, which is designed to foster a sense of brotherhood and pride with those who are also vowing for membership. At the end of rush the student will then be an official member of the club. served at Harvest Farms and other places around the Shawnee Community. Currently under discussion is a Spring Break mission trip. Omega Chi Delta holds an annual 3 v. 3 basketball tournament and an annual back to school Ping Pong Tournament. More sporting tournaments are being discussed.